I've never been a Mac fan (probably due to that chip I'm POSITIVE Microsoft installed in my skull back in the day). However, since they can be found in the corporate environment from time to time, it was inevitable that I would eventually have to deal with an issue with it. Communicator for Mac 2011 provides pretty much the same features as the PC Lync client, including Enterprise Voice. A few Mac in our office have tried to use the Enterprise Voice functionality, but it never seemed to work as advertised. The documentation kept referring to a phone icon in the client, but all our Mac users had just a microphone icon in its place. They could only make Communicator-to-Communicator calls. With me being the Mac non-expert that I am, I dealt with the issue in the best way I knew how: Google for help. That turned up nothing (this was a few months ago), so I did the next best thing: I ignored the issue. However, a client had the exact same issue, and thanks to their help (Yanick from Distributel), we've finally got a solution. Yanick did some digging and found some references to a requirement for populating the Business phone number for Enterprise Voice users to allow Communicator for Mac to work. I found this excellent post from Keenan Crockett at Pointbridge. I won't rehash what he says there, because it describes exactly what to do, with one small but important omission: The phone number you enter in Active Directory seems to have to be in E.164 format (ie +15552221111). Our Mac users are now able to dial phone numbers from within Communicator for Mac 2011. We're almost completely out of the woods, however we are experiencing one odd issue. Whenever we type a number in the dialpad, Communicator crashes with exception EXC_BAD_ACCESS after entering anything more than 6 digits. We can dial successfully if we select the user's phone number from our contact list. We've got the latest updates installed. Has anyone else seen this behaviour? If you've created normalization rules in Lync, you've likely noticed a checkbox at the bottom of the page that says "Internal Extension". 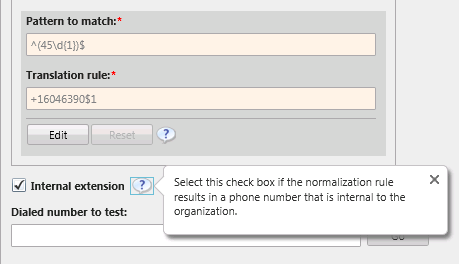 "Select this check box if the normalization rule results in a phone number that is internal to the organization." If your normalization rule did in fact deal with internal extensions, you might have checked this box and moved on. Chances are, the normalization rule wouldn't behave any different than your other rules and you probably shrugged your shoulders and didn't give it a second thought. Well, that's the way I typically rolled until I experienced an issue with a client that made me dig deeper into the whole internal extension thing.